The workshop was a wellness weekend! Yes, the workshop I’d signed up for turned out to be a wonderful weekend focussing on wellness and wellbeing as well as some education. How nice is that? We ate well and often. We chose from a variety of physical activities that ranged from relaxing Qigong to the more strenuous exertion of dancing or running. We enjoyed the lovely facilities at the hotel as well as the park surrounding it. Fortunately the weather was glorious too. We exchanged ideas and experiences. We appreciated entertaining performances by various groups of educators. On Saturday we even used our brains at lectures and seminars. This weekend was the perfect opportunity for someone like me, who doesn’t work regularly in Head Office or in one of the centres, to put faces to names and to connect with colleagues I email. I even got a bit more sock done too! This is a peep into my sock drawer. It’s home to eight pairs of handknit socks. That’s a pair for every day and two on Sundays. I’m very proud of these socks but to be honest this drawer is really not very inspiring. I don’t want to stop knitting now but are there other knitworthy people who’d appreciate such socks? “Stash” is defined as a secret store of something. Okay so far. But check out these synonyms from the Oxford Writer’s Thesaurus: stow, acquire, amass, pack, pile up, load, save, cache, hide, conceal, tuck away, secrete, stockpile, hoard and you can see why someone who stashes yarn might be a bit of a yarnaholic. Ravelry positively encourages stashing – it’s the second tab after projects in your personal notebook. Neat rows of yarn images let you instantly see what colours and yarn types you’ve hidden under the bed, in the cupboard, in bags behind the door. 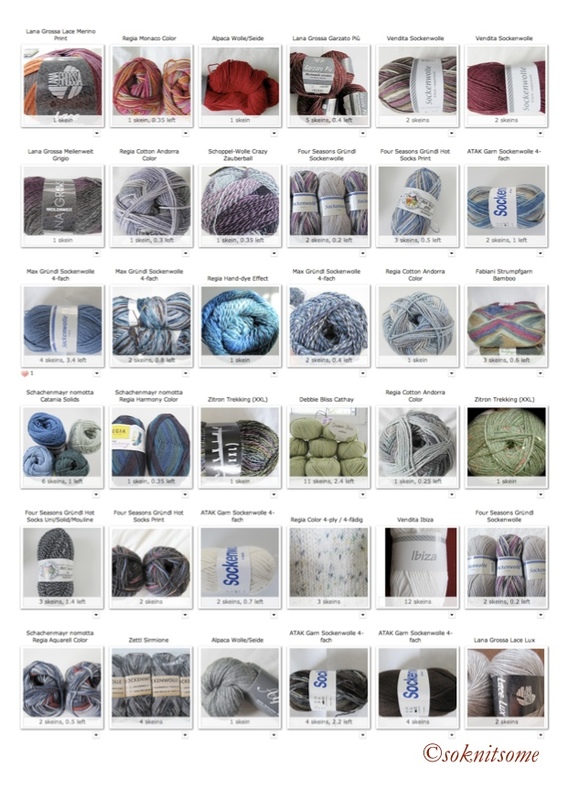 Each pretty picture tells you just how much of that particular yarn you are hoarding intending to use next. So a ball here, a couple of skeins there doesn’t sound like much until you total the metres or yards and discover the miles of potential just waiting to be transformed. I was somewhat surprised to discover that my only box of wool contains almost eight miles of knitting. If it were all yarn for socks that would be almost forty-five pairs. You prefer jumpers and cardigans? I can knit you thirteen.